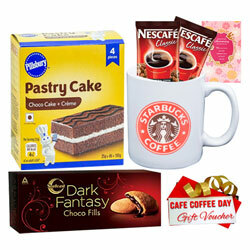 This gift of Delicious Coffee Time Hamper with CCD Voucher will mesmerize the people whom you send this. Add a bit of excitement to your life with this gift Hamper which features items such as CCD Voucher of Rs. 100, Starbuck Coffee Mug, Nescafe Coffee Pack, Pillsbury Cake, ITC Dark Fantacy and Archies Anniversary Card.